★ LOOGAROO ★: SOAP & PUBEY | ALIVE AND WELL! SOAP & PUBEY | ALIVE AND WELL! Who would have thought that this little cartoon that Mick and I sprung from our loins would end up with so much fanfare? - it's mixed feeling fanfare at best too. Soap and Pubey, you either hate it outright, or love it. I've not come across a mixed review yet. Seeing how I've seen more people write me saying they love it then hate it and with two of those people being in a position to broadcast the material, it's time to take this property a little further. (Much to the dissapproval of my wife :o) ). So, moving forward we've attached the musical expertise of Nolan Balzer from Dacapo Productions, Fatkat's Mick Harrison and myself along with the comic genius of Buddy Bolton. Buddy has not only offered to write for the show but has also enlisted some other comedians and their content to be reused as material for The Soap and Pubey Show! Our first comedian, the great Otto Peterson. Here's a write up on him and his partner George. In today's standup comedy market, the business is flooded with the usual solo act that routinely tells you about their to trip to the club, what they did that morning and how they're having problems getting dates. There's always an orchestration that takes place, a seemingly planned string of observations and commentaries about life that's usually predictable and generic enough to engage the audience. With Otto and George, there's nothing predicatable, nothing generic. When you first see him arrive on stage, your first impulse is to say to yourself "Geesh, a ventriloquist, what is this, Paul Winchell and Knucklehead?". Immediately you feel somewhat uncomfortable as a seemingly uneloquent, almost out of place man sits in front of you with a less than a "state of the art" dummy on his lap. However, within minutes that all changes. As if a lightning bolt from the comedy gods hits the stage, this mannequin comes to life with a explosive barrage of insults and pontifications about life that would even make a truck driver blush. As if with an invisible machine gun, he'll lay waste to every politically correct social precept, the first two rows of those in the audience and anyone daring enough to get up to go to the bathroom. 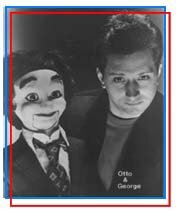 The interaction between the straight man Otto, and the dummy George, is intoxicating to watch. You take part into the illusion, you REALLY believe there are two people on stage. Despite the abuse, the badgering and the seeming unending vituperation of every known expletive, you don't blame Otto and begin to feel bad that he has to put up with George. It's so unbelievably cool that we have permission to use Mr. Peterson's content for Soap & Pubey. We'll do our best to offend everyone on the web Otto! Then off to latenight TVLAND! 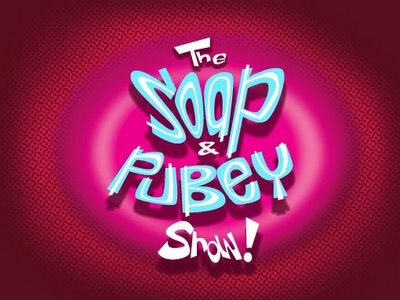 To help in our quest we've now registered www.soapandpubey.com which will host episodes, bios on the creators and producers and contributing comedians, a blog will also be maintained by none other then Pubey himself! FUN! We're even thinking of section where budding comedians can upload their jokes to have Soap and Pubey use in the show, if selected the winner will recieve an obvious credit on the show, an interview on the site and some original Soap & Pubey swag, signed by the creators! What fun! It's going to be great!